This description was given to me by my sister Flora Parsons, who attended school there. She has very happy recollections oh her school days in the little log cabin with only about a dozen pupils. Her first teacher was Stephen Ruddell, son of the man who gave the plot for the Pioneer Cemetery. In 1875 as most of the pupils were in the south end of the district, it was decided……location. Therefore they leased two acres of land from Nathan Eaton situated in the north west corner of the field south of the Old Fort site and the Yelm road. The building was blocked up on rollers and hauled to the new location. It was somewhat wrecked but was repaired and used until the present building was erected. Some of the happiest days of my life were spent in that old school building. The days were never so stormy but what we were glad to walk a mile and a half to school rather than miss a day. The old log forts were our play houses. Two of them were still standing at that time. The act to create the office of Public Instruction makes it the duty of the Superintendent to collect all such information as may be deemed important in reference to common schools, especially the number of children; the number and quality of schools, the number of scholars in attendance; the amount paid for tuition, also, to collect information of the number of school houses, and the amount expended from year to year for the erection and repairing of school houses, and all other matters in reference to the operation and effect of the Common School system, and report annually to the Legislature . . . . .
My report, from the nature of the case, will be very unsatisfactory, from the fact that out Common School system is not yet matured, and the act to create county Superintendents does not make it their duty to report to this office. I have corresponded with all the county Superintendents during the year, requesting of them such information as desired by law. . . .
We have been enabled to visit a number of schools in the Territory, and we are gratified to notice the interest on the subject of education among the people. Too much can hardly be said in favor of Popular Education. It dissipates the evils of ignorance, which are the greatest hindrances to the progress of our free institutions. It increases the productiveness of labor in all the industrial pursuits of civilized life. When its appliances are wisely arranged it always tends to diminish pauperism and crime, and to promote human happiness. Hence we would urge upon you the importance of developing our educational interests. . . .
We have about fifty three school houses in the Territory, and some of them are not worth so much as the name of a school house. The probable cost of these buildings will not amount to the sum of twenty-six thousand five hundred dollars. As the country is yet new, and we have just begun to build out school-houses, we would suggest to the directors of school districts that when you build school-houses, do it well-make them large and comfortable. “The thing that is worth doing is worth doing well.” Let us prove this in every school-house we build-let each one be an ornaments to the district and to the Territory. Anonymous Teacher Quoted in Notestein, Wallace. The English People on the Eve of Colonization (1603-1630) New York, Harper & Row, 1954. Teachers have been working on the Yelm prairie nearly a century and a half. 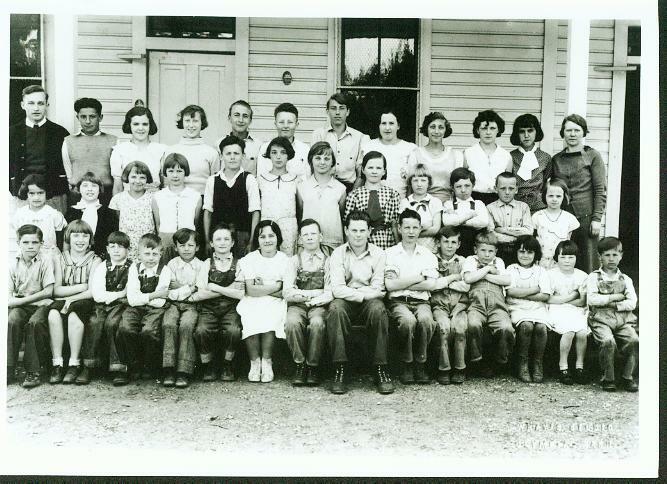 The names of early teachers who worked at the school is another interesting historical puzzle. Local historians place J. C. Conine at the school in 1872. According to one, he taught for three terms. 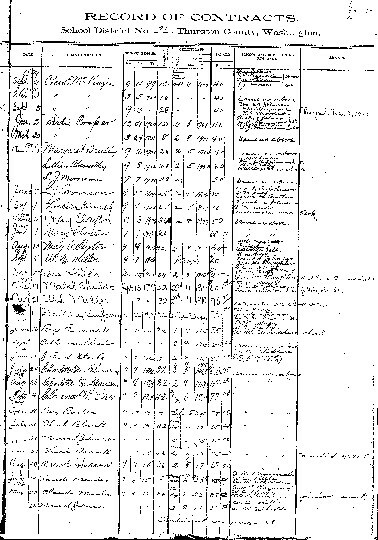 This meant that he worked possibly three months, per term, teaching, but census data shows he considered himself a “farmer.” Another account places him at the school in 1872. More recently, evidence has surfaced that places Dillis B. 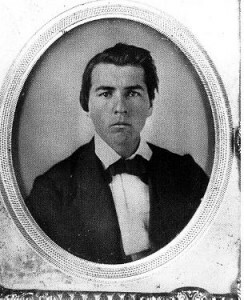 Ward in the Yelm school house in 1863. There is ‘a short reference to Ward in Early School in the Washington Territory. The author states that after Dillis B. Ward left his recently closed school in Seattle he “taught at Yelm prairie.” David Longmire, writing in 1917, identified Ward as “one of the teachers at that [Yelm prairie school] school.” In 1957, the Seattle Times profiled Dillis Ward’s daughter, Maud Ward Dickey, who shared part of her family’s past with the reporter. Among the paper legacy she presented were letters written by Dillis to his fiance é living in Grand Mound. The letters, dated 1863, Yelm prairie, make him, for now, the earliest known teacher on the Yelm Prairie. 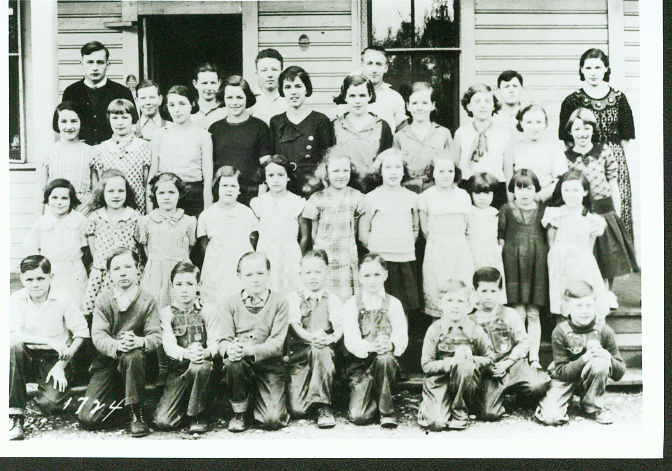 Lew Longmire, Mrs. F. N. Edwards, and Mrs. Jack Kettleman wrote the essay on education for Loutzenhizer’s The Story of Yelm. 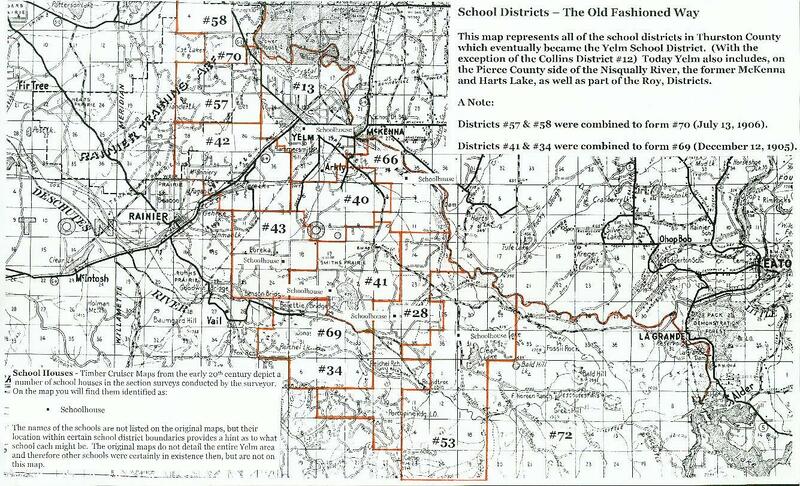 In their chapter they listed teachers that long time residents linked to the schools of the area. Their collective memories produced the following list of instructors. The year that follows each name represents a year that that their employment was documented on county teacher rolls. The fluctuations of the school year and salaries may have discouraged, but did not deter, teachers from pursuing their craft. Edith Corbett (the second woman to successfully climb Mt. Rainier) worked at the Morehead School in 1891 and 1892, taught the children of the Smith Prairie school in 1893, and was at her third school, in as many years, Mountain View, in 1894. May Collins, who had failed to be licensed in 1891 at the age of 17, eventually became a teacher, beginning her career at the Eureka school at the age of 19, but moved on to the Smith Prairie school in 1899. Belle Melvin had been certified to teach in 1895 at the age of 18. Two years later she was working at Willow Lawn, but moved to the Mountain View. If you believe the ages of the teachers sounds rather young. You are right. A sample taken from the county register of new teachers in 1895 shows that the average age of recently certified teachers was only 21 years of age. Those who failed to pass the test averaged only 20 years of age. What a revelation to many teachers have been the hard time? We had talked of our profession, of professional work, etc., and what do we see today? Lawyers, real estate agents, insurance agents, book agents, farmers, doctors and barbers have become teachers—yes teachers. There are one large class and two small classes of people today. The large class is made up of those that can get third grade certificates. Of the other two classes one is in the asylum for the feeble minded and the other has higher grade certificates to teach. In the French District, Abigal Eddy was hired in October 1891 to teach for two months. That term of school would have ended in December of that year. She was rehired in December 1892 to teach for four months. Leaving the school permanently in the spring of 1892, a replacement opened the school doors in the fall of that year. A shortage of teachers might have also contributed to delays in schools opening on a regular basis. Equally flexible were teacher’s salaries. When Abigal Eddy signed her contract in the fall of 1891 she received $40 per month. This, however, was before the depression of 1893. as the depression deepened, revenues to the county declined. Counties tightened their belts. Counties and the districts lowered wages. When Bige Eddy signed his contract in 1893 the salary had been lowered a little over ten percent to 35 dollars per month. That, however, was just the beginning. By April 1894 teachers received $25 for the pedagogical efforts. The bottom was reached in 1897. By that year a teacher’s pay had been reduced by 50% from their 1891 peak. The contract signed that year also included “board” (a teacher would live with a local family). Some family was making an attempt to help lure teachers to help their children. …There are thirty-four organized districts in this county, in all of which with two exceptions, at least three months school has been taught during the year just closed. A number have maintained two terms (six months) of school. Last year the average term of tuition though all the districts was frequently over four and one-half months. Supt. 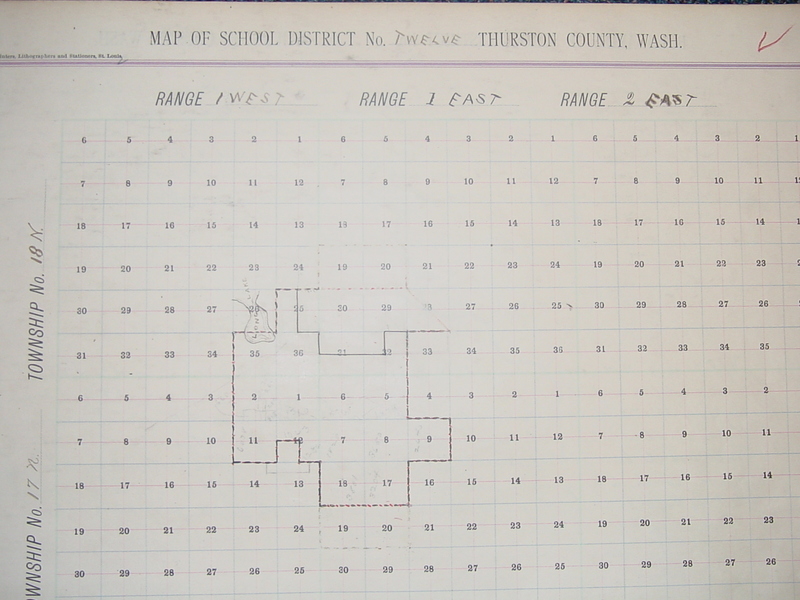 Schools, Thurston County, W.T. It would have been hard for a teacher to make a family supporting career working in one of these small schools. For one thing the pay was lower than in urban areas. This can be inferred from data collected by Alexander Pouw-Bray in Change in the Common School System of Washington State, 1889-1899. According to his estimates the average male teacher in the state received, at the bottom of the 1893 depression in 1895-96, between 44 and 47 dollars per month. His female counterpart received between 38 and 42 dollars. Records show that some teachers in the Yelm vicinity were being paid as little as 27 dollars or even as low as 20 dollars a month. The fluctuations of the school year and salaries may have discouraged, but did not deter teachers from pursuing their craft. 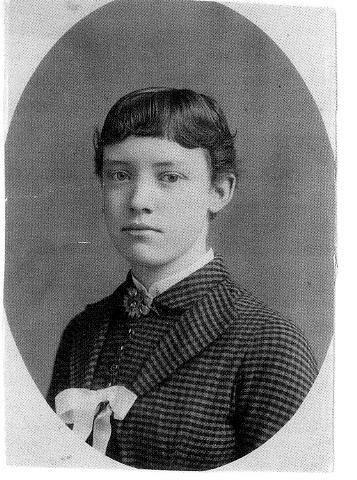 Edith Corbett worked at the Deschutes (Morehead) school in 1891 and 1892, taught the children of the Smith Prairie School in 1893, and was at her third school, in as many years, Mountain View, in 1894. May Collins, who had failed to be licensed in 1891 at the age of 17, eventually became a teacher. She began her career at the Eureka school at the age of 19, but moved on to the Smith Prairie School in 1899. If you believe the ages of the teachers’ sounds rather young, you are right. A sample taken from the county register of new teachers in 1895 shows that the average age of recently certified teachers was only 21 years of age. Those who failed to pass the test averaged only 20 years of age. The following list demonstrates the mobility of teachers in the late 19th century. 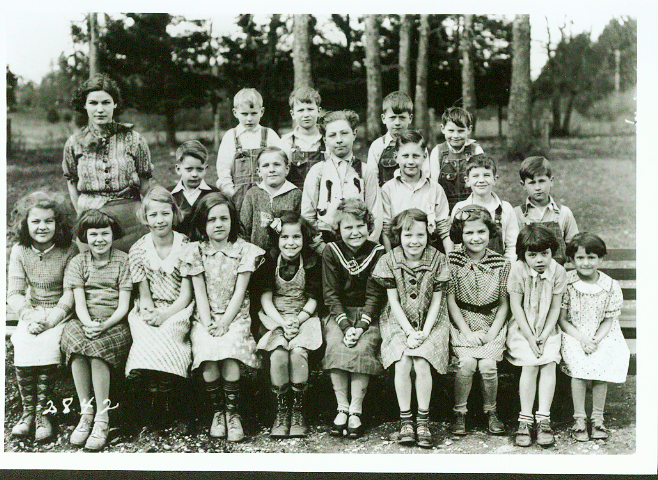 The names and dates were gathered from school records available at the state archives in Olympia.